Data Wiping Software is easy to use wiping utility which clean files on your local disk, removable drive, file and folder. 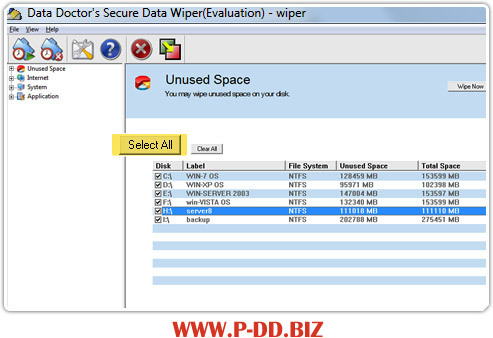 Data Doctor Secure data wiper is an advanced data erasure tool which permanently wipes and removes all deleted confidential record information from your hard disk drive or USB removable media and safeguards the computer privacy. Secure Data Wiper ensures total files unrecoverable elimination and irreversibly wipes unallocated area and deleting records of your offline and online internet activities, such as history, cookies, typed URL list etc. ✔ Permanently wipes all your deleted data files and folders. ✔ Free the hard disk space for better performance of your system. ✔ Wipe unused clusters which are not linked in the file system. ✔ Allow viewing files before wiping the content. ✔ Software is easy to use with no technical knowledge required.